The Moto X series is probably one of the most popular Moto series we have seen so far, but after 2015, there was no new Moto X variant launched by the company although there were rumors of a Moto X 2016. 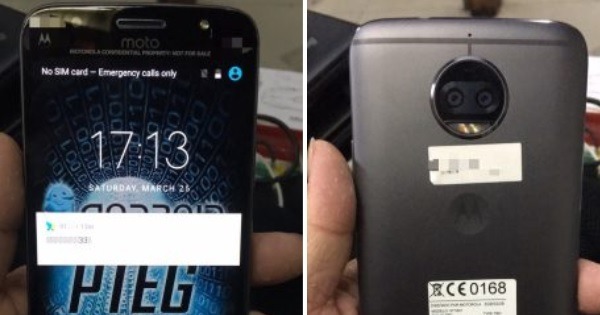 Anyways, it is now confirmed that Moto X 2017 will launch in few months and the phone was leaked a month ago via the official video by the company on its Anniversary. One thing that is clear via the previous leaks is that the phone has a dual camera setup on the back. Today, it is again confirmed via the official presentation video that has leaked, revealing the design of the phone as well as a couple of more features. First of all, the phone is IP68 water and dust resistant meaning that you can take it into the water without any worries. Along with that, the phone has a whole new design with full Metal and Glass body and a dual-camera setup on the rear. The camera module is round just as in the newly launched Moto phones and is protruding out. There is a grill on the camera module that could be the speaker, but it is pretty odd to see a speaker on the camera module and also on the back side by Motorola. The video also says that the phone has ‘AI Integration’ which means that this device is a special one from Motorola. We cannot confirm the existence of headphone jack because only the sides, front, back and the bottom is revealed via the video and not the top. And we all know it is a tradition by Motorola to keep that headphone jack on the top on its phones. Well, we are now finally aware of the design of Moto X 2017, and the specifications will be revealed in few days for sure because leaks never stop. What are your views? Do let us know via the comments section.